Harper is the length of a Carrot!!! Ever since the football game Saturday night - I have really started to feel her kicking. It's so fun. I feel her so much through out the day now and I just start giggling every time because it's so amazing. Scott has even felt her a little now! This is one of the cute outfits my mom brought over to me on Saturday - won't she look precious in this next summer? Her closet is filling up fast (we've known it's a girl for what - two weeks) ha ha! I got the most AMAZING package from a blogger, Mandi, today. I am overwhelmed with all the neat things she sent me. She has a really neat story of not being able to have a baby so they went through the foster system and she got a brand new baby boy and they are in the process of adopting him. He is BEAUTIFUL!!!! God answered their prayers in a different way but such a sweet way. She said that bath time was one of her favorite times with him - so she sent me the bath goodies - including that PRECIOUS hooded bath towel she made and that ingenious bath apron for me to wear while I bathe Harper. Thank you Mandi - you are the sweetest!!!!! Another exciting thing is that the Lord continues to move and answer prayers! I have now had more than 10 girls that I have prayed for this year become pregnant. One of the people who has really been on my heart is Stephanie. I have prayed for her so much this year - especially since I became pregnant. Imagine how thrilled I was to check her blog yesterday and find out she is expecting. I read it and sat at my desk and started SOBBING. Scott walked in and thought I had lost my mind. But to see God continue to answer prayers gives me SO MUCH HOPE to keep praying for the others out there who are waiting. I know God's answer may not always be what we expect - it could be for adoption or for fertility treatments or to wait a little longer - but I believe He will answer if we trust Him. Harper is going to be a well dressed little girl! Congratulations! Harper is going to be one stylish girlie! You look great and so very happy! Your face radiates with thankfulness. Take good care of yourself and yes, Miss Harper will be beautifully dressed! I love all your updates about how big Harper is getting! She is going to be a cutie patootie in that little romper your mom gave her!! Harper is definitely going to be stylin'. All of her little outfits are sooo cute! It makes me want a little girl. You look great! That is so exciting that you can feel her moving now, that is such a neat experience! I just LOVED this post...I thought the dress you were wearing was just TOO cute. 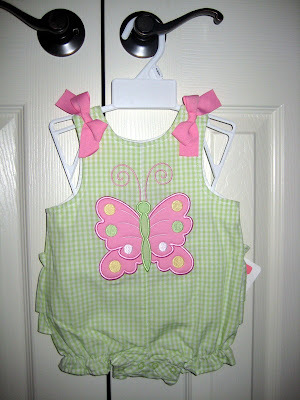 I LOVED the outfit for Harper too, pink and green are one my favorite combinations. I also held back a few tears in my eyes when I read about your friend who just found out she was pregnant. I am continuing to believe and praise God for all the blessings that I already have and for those he has planned for me. I SOOO look forward to the weekly Harper updates! My how she's growin'! CUTE dress, by the way. When I was pregnant with the boys I used to sit on the couch after supper and just bond with the baby and feel them kick and kick... and tell Dave I wish he could be pregnant just for ONE day to see how amazing it is. There's just nothing like it. I am loving being able to see you go through the changes Harper is bringing! Kelly You want believe this ,but Kennedy Grace my little girl has that same outfit from Dillard's with the pink butterfly on it. I love it so much and you will too! Congrats again! Cute outfit - just look at that closet! By the time she gets here, she'll be one stylin little girl! It is so awesome feeling babies inside of you - loved every minute of it, especially when I was told I would possibly lose my last child. Every little movement was such a comfort to me. That dress looks fabulous on you!!! I'm so glad you like the hooded towel and bath apron! WOW...the length of a carrot? !...Babies grow so fast!!! That dress looks great on you! But you would look good in a potato sack! I LOVE the butterfly bubble suit. Hi Kelly! I've been super busy lately but I just wanted to stop in and congratulate you on your little GIRL! How exciting! I must say, girls are - wonderful. Not that boys aren't, but there's just something special about that mother/daughter bond...not to mention seeing daddies with their little girls - heartwarming! I find out on the 16th what we'll be having! i loved feeling my babies move, too. when i laid down to go to bed each night, my firstborn would suddenly decide to kick and punch so much it felt like she was in a turbo-kick class! so i made sure to "share the love" with my husband--no way was he getting away with a calm night's sleep while i was being kept awake! so i'd turn over and sleep belly-to-back with him so he could "experience" it too. :0) HA! What a great post to find out about your friend! I LOVE Harpers hooded towel. Where can I get one of those? Yay! A carrot! She sure is growing. And I love that dress on you. You look adorable. That's wonderful news about your friend! Another cute outfit--you're going to have so much fun dressing her every day!!! You are too cute in that dress! I saw that dress at Motherhood and loved it! I tired to find it in my size but they didn't have it. I'm sure I wouldn't have been as cute as you are in it! The closet is too funny! You might have to change her clothes two or three times a day just so she gets to wear everything you have (and will have) when she arrives!! LOVE the dress, my friend!! So pretty!! And I am loving that hooded towel - it is perfect! And now let's address the butterfly bubble suit...SOOOO cute. Harper's closet has definitely got it going on!!! I just clicked over and read Stephanie's story and was so touched. As I wait and pray for a second baby myself, it is such a blessing to know that so many people I don't even know are praying with me. Harper's clothes are so cute! She is going to be one well-dressed baby! I just wanted to say thank you for your constant encouragement to those of us who are hoping and waiting and trusting for God's time for us. Your story has been inspiring and it's been encouraging for me to find other bloggers in the midst of the same walk of life as I am. I'm not a big fam of carrots but I think that one is pretty dern cute! That dress is cute! I also like Harper's hooded bath towel! Thanks for all the emails and the prayers! And the last paragraph is what I needed to hear today!! Thanks!! Have a great wednesday! I love the updates that you have been giving us on Harper's size ;)! Her closet is filling up fast but isn't it just so much fun?! I love that little romper ;)! I just found your blog today from In the Life of Five Year Olds. I have so been enjoying reading it this morning! I can't wait to come back and read more. Harper is one of my very favorite girl names! She has adorable clothes! I am so thrilled to hear the joy of so many pregnancies. Praise God! You look adorbale, and the closet will be full to bursting by the time that sweet Harper gets here. Girls are SO fun to dress... until they hit middle school:-) Oh, how I miss those sweet dresses and matching bows. I love the updates. That dress is too cute and I can't wait until you start wearing some sho nuff maternity clothes. lol. Maybe it was all the hype of the game that got Harper all rowled up. 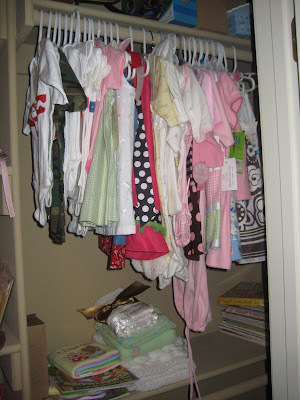 She is going to be one cutesy little girl in all those clothes. I love that dress. You've said that you usually wear black, but the color and print are so fun and flattering. And, 21 weeks, you look fantastic! I watch your blog daily and I am pregnant as well..due March14th. I love your stories and totally agree God is great. AS well as you we have had huge issues but I am now on my second child and LOVING life and what god brings. God bless you and I love your blog. You look GREAT and the idea of a bath apron IS ingenious! Thank you for praying for me and the rest of us still waiting on our miracles. I am praying for grace to trust Him more! You look great!!! Isn't it fun shopping for a little girl??!! I would be happy with a second but, we'll take what God provides happily! Oh, I am so happy your friend is expecting! I think pregnancy is such a beautiful thing, I get excited to hear about anyone expecting, if I know them or not! Harper is going to be the best dressed baby girl in NWA! Kelly, thanks for sharing our story on here and for being a sweet and faithful prayer partner. I have LOVED watching you take this journey and I look forward to taking it with you from this point on. Harper's going to be one darling little girl with a great closet!! Congrats! !